I've been away for a week at a writer's conference, but I'm back, and I'm blogging about the evolution of knowledge. One of the central pillars of personality type is whether you are okay with things being open-ended and unresolved, or whether you need certainty and completeness in your life. Would you rather cling to a certainty, even if it's a lie, or can you live with the often unsettling uncertainties that form along the way as you search for the truth -- are you okay with knowing you may never find it? If you are thrilled by the mysteries of the unknown, made excited and curious by them, if you are willing to entertain theories about them, you are okay with uncertainty, and you are probably scientifically-minded. If on the other hand the mysteries of the universe are terrifying and chaotic and disorderly to you -- without a strong belief in a God whose Plan is being meticulously executed by the things you don't understand -- you need certainty and completeness, and you are probably religious. If you are terrified of a president who says, "I don't know," or who admits to flaws, you need certainty, are probably religious, and are probably conservative. If you are terrified of a president who is always "certain" about everything he does (when you know perfectly well that no one can be certain about everything all the time), then you are okay with the uncertain, you are probably scientifically-minded, and you are probably more liberal. Important to the scientific mindset is a comfort with the evolution of knowledge: with the reality that we may labor under theories that are not quite right, that will need to be altered and revised over time so that we can get closer to a truth we may never fully possess. Consider the models of the solar system that have been proposed and amended over the years, or the models of the atom, or the models of eukaryotic cells -- and each time those models are changed, it's a good thing, because we've eliminated one more possibility, and are pushing the whole human pursuit of knowledge a little further towards the truth (even if we never see it). I bring this up because June of 2008 is a notable moment in the advancement of knowledge. New research has indicated that the model of the Milky Way Galaxy (where we live, and which we therefore can't quite see directly) was flawed, and it has been redrawn. For your curiosity and intellectual amusement I give you Our Galaxy, before and after (the before picture has our location noted). This older conception of Our Galaxy shows four major spiral arms. 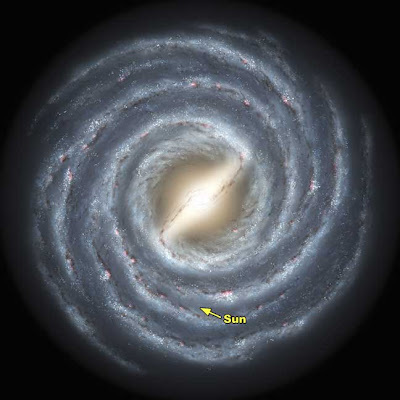 This newer vision of Our Galaxy shows only two major spiral arms, plus some partial arms. Though the location isn't noted on this image, we are located on a partial arm.